Mens shiny dress shirts are what you wear when your time is your time and you want to shine for the evening. You don't have to be an entertainer from Branson Missouri to appreciate the way you will look wearing a satin shirt and tie combination from Contempo Suits. Since specializing in mens satin dress shirts is job one, you'll be more than pleased with the huge selection of colors and sizes available and be able to shop quickly for the satin shirt and tie combination that you are looking for. 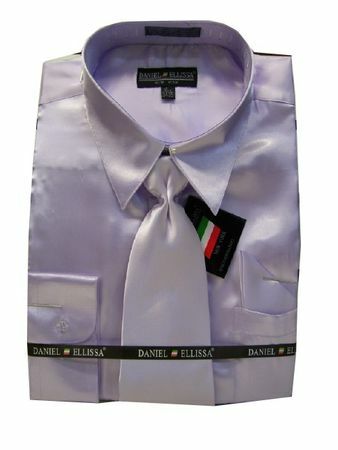 This lilac color shiny satin dress shirt and tie combination features a classic fit with one chest pocket, a pointed collar and matching lilac color tie and hanky ready to entertain the crowd. Find how affordable our Mens Suits are here.